With 1.77 million admissions, business was still a little down from this time last year (when admission topped two million) due to a lack of strong new releases. Though with a 60% market share, local releases are still in good shape. This month's new films have been relatively low profile but things should pick up in the coming weeks with some higher profile domestic films, not to mention the invasion of Hollywood holiday fare. Topping the chart was AM 11:00 though it did so without any real competition. Its 377,166 admissions over the weekend was not a great start and its poisonous reception is unlikely to convince more viewers to come and see it. There's a chance this will plummet next week and miss the one million admissions mark completely. Save for Bong Joon-ho's Snowpiercer this summer, science fiction fare has traditionally had a hard time at the local box office. 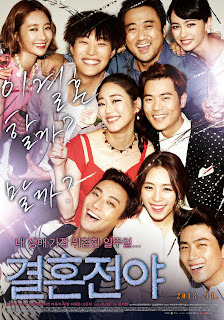 Rising to number two with a slight 25% drop was the ensemble romantic comedy Marriage Blue, which added 233,139 in its sophomore week on the chart. It will cross one million in the coming days and solid word of mouth may yet bring it further, though the next milestone is quite a distance away. Dropping one spot and shedding half its business was the new Hunger Games as it drew another 206,554 admissions. Hardly blockbuster figures but the film is already well ahead of its predecessor's 600k total. The Im Chang-jung noir Tumbleweed, which had its world premiere all the way back during last year's Busan International Film Festival, opened with 201,916 admissions, quite strong given the film's relatively low profile and no doubt a reflection of Im's star power. Though with weak notices and given its dark nature, the film may not survive much longer. Long-in-the-works sequel Friend 2 dropped four spots and almost 60% for 197,204. With a 250k gap remaining, it might still squeeze past three million admissions, which would represent a decent, if unexceptional haul for the gangster thriller. At number six, Cloudy with a Chance Meatballs 2 slid 23% for 194,587. Much further behind was the debut of Vin Diesel's Riddick, a stillborn release with just 73,758 admissions. Lee Daniels' The Butler opened at number eight with 44,522 while Thor: Dark World was just behind with 44,050, which was enough for it to cross the three million mark. Gravity had what will most likely be its last spin on the chart with 29,099 admissions in tenth place. The pic has taken in a stellar KRW 30.5 billion ($28.73 million). For the first time in quite a while there will be no new Korean releases at all next week while other new releases are unlikely to cause much commotion. Business will probably dip again as a result while the release of Way Back Home next week will likely admissions will likely com roaring back.